We negotiate your customer service claims so you don’t have to! If you have an issue with any product or service but don’t have the time to navigate Customer Service departments, let us negotiate a resolution for you. We deal with issues small and large. Sign up for your FREE CUSTOMER ADVOCACY CONSULTATION! We negotiate b2b resolutions, freeing business owners to grow their businesses and achieve greater success. Our advocates are trained to resolve problems ranging from Accounts Receivables collections to product, service, contractor and vendor disputes. We recently settled a b2b claim for $50,000! Sign up for your FREE BUSINESS ADVOCACY CONSULTATION! 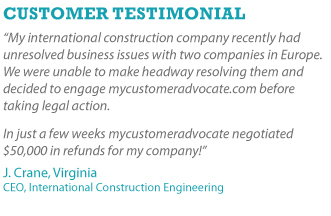 Mycustomeradvocate.com is a one stop concierge customer service site for busy individuals and businesses who value time, money and peace of mind. After your FREE PHONE CONSULTATION you pay a nominal registration fee to engage our services. Your Advocate goes to work immediately negotiating the best resolution possible. You only pay a service fee if we provide a resolution for you!